Taking inspiration from the school’s name, Mizrachi (from the east), which is the traditional orientation of Judaic worship, the main classroom building is skewed 4° due East through the center of the atrium—shifting the grids slightly between the two halves. 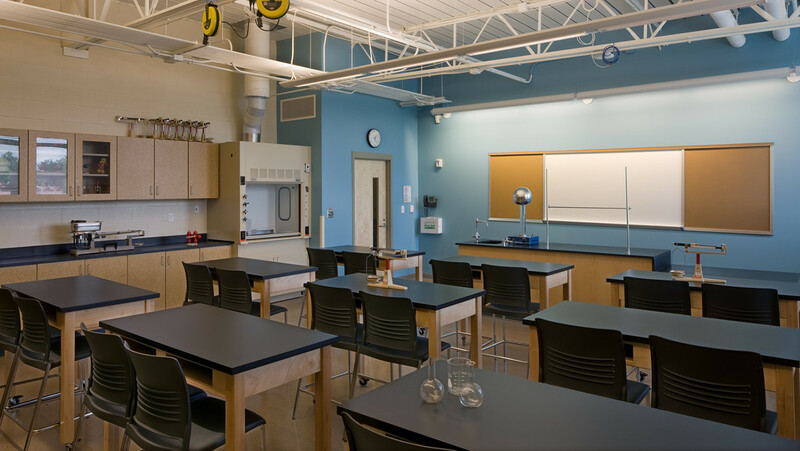 The client challenged us to design a single facility for students of extremely diverse ages (pre-kindergarten through high school) that created an environment to foster community learning and progressive development. 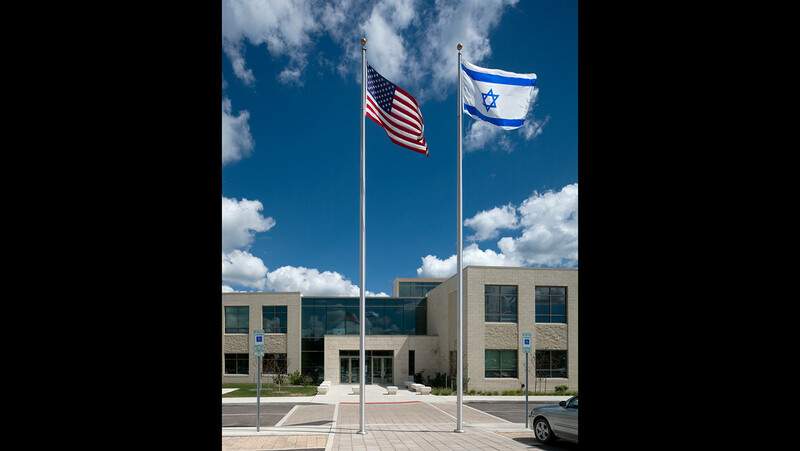 During the design process, an interest and opportunity developed to use Judaic symbolism related to modern orthodoxy throughout the design of the facility, which is deeply rooted in the traditions of the past while living in a modern world. 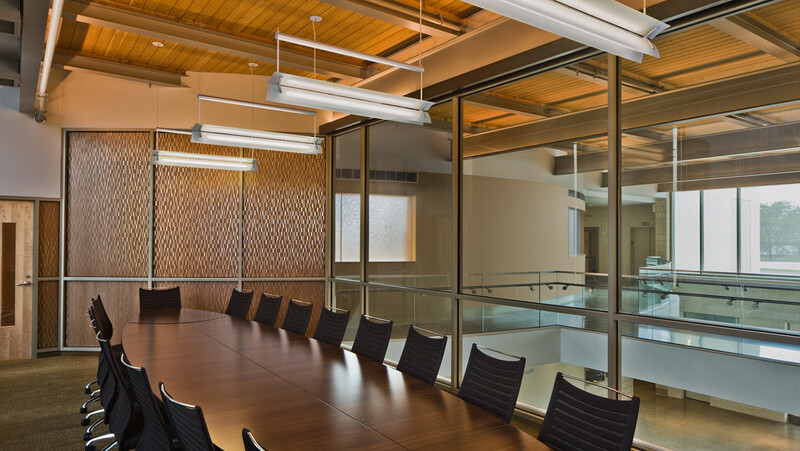 Our team’s design mantra was one of efficiency and resourcefulness in every aspect of the project from respecting the 10 acre site, pursuing the highest sustainable design aspirations, and working within a modest construction budget of less than $200 per square foot. 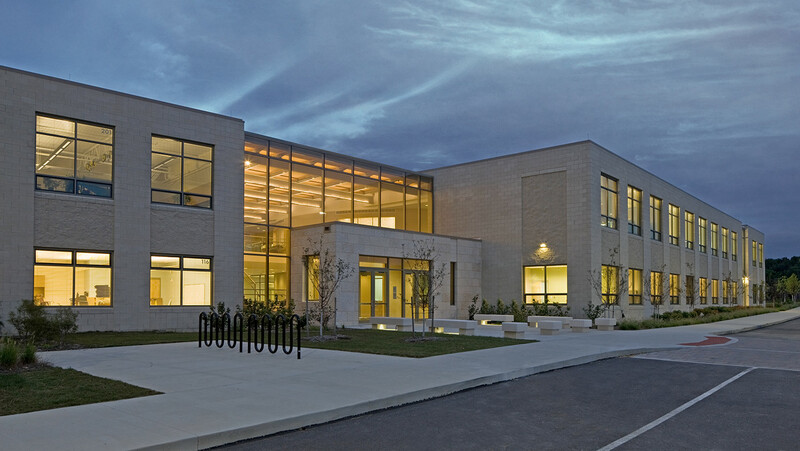 Taking inspiration from the school’s name, Mizrachi (from the east), which is the traditional orientation of Judaic worship, the main classroom building is skewed 4° due East through the center of the atrium – shifting the grids slightly between the two halves. The main atrium, which is the heart of the learning community, exhibits a grand stair and dramatic bridge connecting the northern and southern portions of the building. The stair symbolizes Aliyah (stepping up) and the bridge is the symbolic and physical link that ties the students of all ages together. 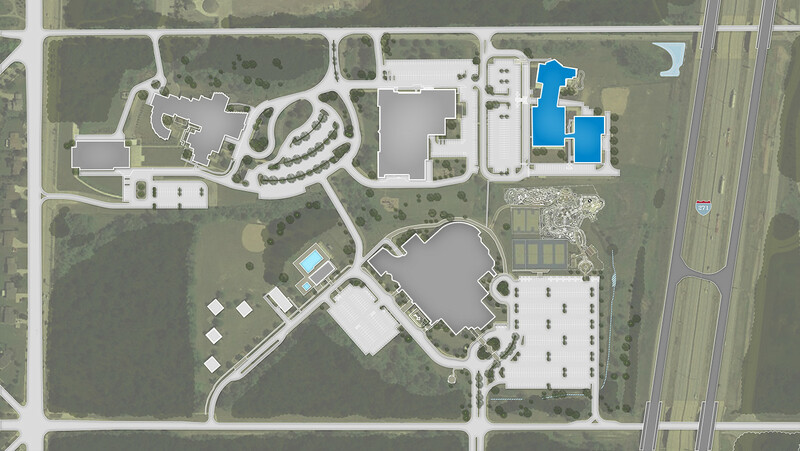 The northern half includes the early childhood on the lower level, with an independent entry and isolated playgrounds, as well as the middle school above. The southern half includes the elementary school on the lower level and the high school above with a large Bet Midrash (house of learning) as the central focus. 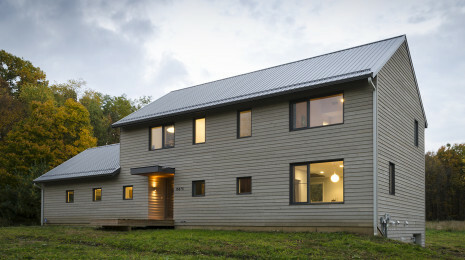 The exterior material palette is very minimal and durable with mostly local materials of block, stone and metal paneling. 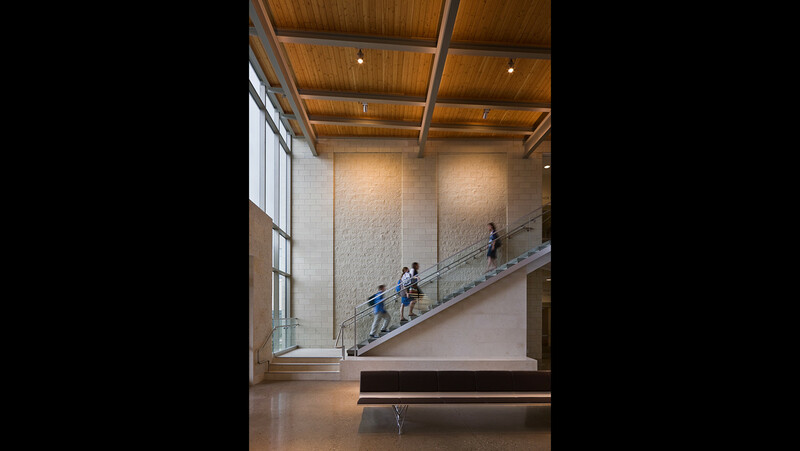 The interior adds wood and polished concrete to the palette as well as exposed structure throughout most of the building to reduce materials. The building façade carries on the symbolic nature of the religious studies with the proportion and patterning of the windows inspired by a Torah Scroll. 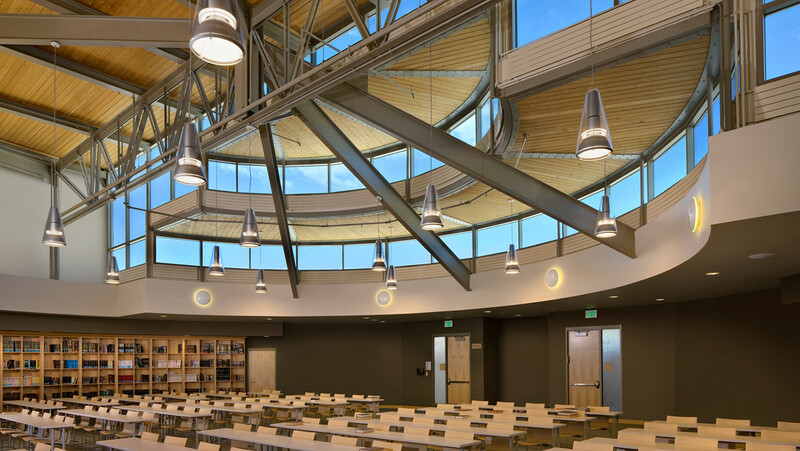 The sustainable strategy for the school stems from the Judaic philosophy of Tikkun Olam (healing the world) and includes maximizing daylight, geothermal heating/cooling, low-flow water fixtures and a highly insulated building envelope.